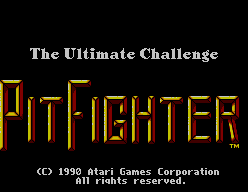 This is Pit-fighter, a crazy no holds barred fighting game where only survival and big prize money matter. You take control of one of three fighters, Ty a champion kick boxer, Buzz an ex-pro wrestler or Kato a martial arts expert. You must fight your way through ten one-on-one fights, whilst on the way earning big bucks. The game is a port straight from out of the arcade of which I was a big fan of. 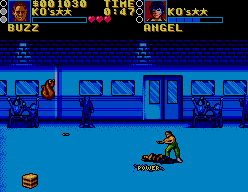 The gameplay is pretty basic, with only punch, kick, flying kick and a special move as your way of attacking. This makes the game get tedious very quickly; I found the best way to victory was simply flying kick your opponent and you can't fail. 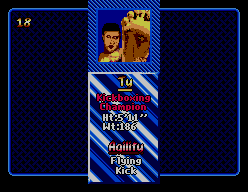 The option of having a two-on-two brawl is missing but that's understandable considering the SMS capabilities. The graphics are very average with the sprites being way too small but the backgrounds being varied and fairly detailed. There is no BGM to this game and the sound effects are terrible, not good punching effects make the game even more laughable. The controls are OK, easy to grasp and respond alright. However trying to pick up a weapon or power pill can be hard at times and you're usually beaten to it by the opponent from no fault of your own. This game is one you'll play once then not bother again in a one player mode. In a two player game you and a friend may have a laugh for about ten minutes. After beating this game with ease by flying kicking at every opponent i doubt you'll ever return to it. The lack of moves is the main negative point to this game. It just becomes very boring very quickly and a two player option doesn't make it any more interesting.